The purpose of this treatise is to bring the characteristics of the disastrous events of the region to the fore, seeking to present not only the continuing fatalities and fragilities of the area, but also the possibilities for coping with natural disasters. In the aftermath of considerable seismic unrest caused by the tsunami in the Indian Ocean, this volume focuses on exposing the coastal vulnerability of the region. Despite a plethora of enquiries into natural disasters in different parts of the globe, there is now a more conspicuous concern than ever for the South East Asian region. This global concern has become all the more prevalent since the Hyogo Declaration in January 2005 and the recent Asian Summit in Indonesia. The purpose of this treatise is to bring the characteristics of the disastrous events of the region to the fore, seeking to present not only the continuing fatalities and fragilities of the area, but also the possibilities for coping with natural disasters. The book’s layout is specifically shaped by the nature of the damage and threat caused by these disasters, particularly concerning the communities at risk and their responses. This book will appeal to those involved in both global and local organizations as administrators, facilitators, stakeholders and activists, as well as Governmental / Non Governmental agencies, societies including organizations such as ESCAP, UNDP, WMO, UNESCO, UNCRD. 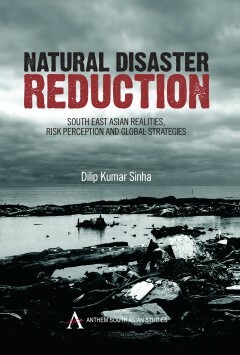 Dilip Kumar Sinha has published and lectured extensively on natural hazards and risk management, and was an active member of the Task Force set up by the Government of India. He was the Coordinator of the Centre of Atmospheric Sciences and former Sir Rashbehary Ghosh Professor of Applied Mathematics at Calcutta University, and Professor of Mathematics, Jadavpur University. He has been Vice Chancellor, Visva Bharati, Shantiniketan and Pro-Vice Chancellor, Calcutta University.